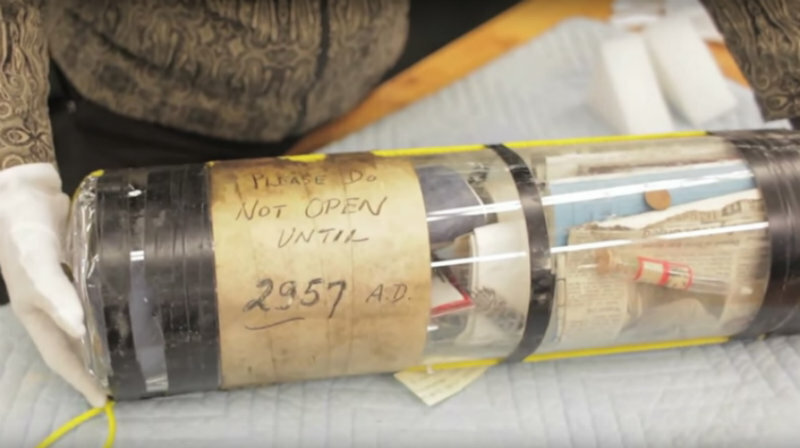 A Time Capsule From The ’50s Is Found At A Construction Site At MIT… See What Was Inside! This is really a great story. In 1957, students and faculty members at the Massachusetts Institute of Technology (MIT) decided to do something special to commemorate the opening of the Building 26, home to the Compton Laboratories. That’s when Harold Edgerton, the renowned professor of electrical engineering, came up with the brilliant idea to create a time-capsule. Fast-forward to 2015, when a construction crew working on MIT’s new nanotechnology laboratory (MIT.nano, Building 12) came across something that “looked a little out of place,” as senior project manager Travis Wanat described. After further investigation, school officials confirmed that what they found was indeed the time capsule buried nearly 60 years ago. According to MIT, some of the items found in the capsule include coins from the First National Bank of Boston, a commemorative mug for the MIT Class of 1957, a small container of synthetic penicillin, and a cryotron, “the tiny unit invented at MIT this year which will replace complex tubes and expensive transistors in electronic computers of the future.” The capsule also contained a letter from Dr. J.R. Killian, who was the president of the institute, which was really quite inspiring (see photo below). The time-capsule itself was also quite brilliant; a glass cylindrical-container designed to keep the contents air-tight and protected — as opposed to other time capsules made of wood or metal that might potentially rot or rust — that Edgerton and his team filled with argon gas before sealing! Labeled “Please Do Not Open Until 2957 A.D,” it’s clear that they intended for this capsule to last for at least 1,000 years. 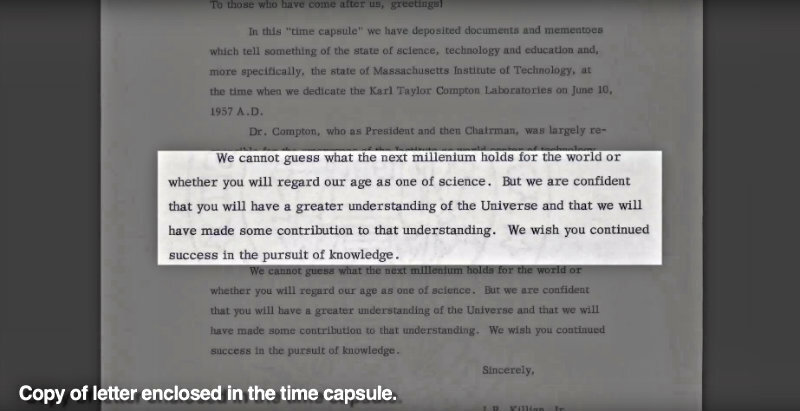 According to The Tech, MIT’s oldest newspaper, the capsule hasn’t actually been opened. They have records of what was buried, and they plan to rebury the time capsule with a new glass sleeve (and possibly with another new time capsule).